The eGuide for iPhone was recently updated with all new high-resolution images which can now be displayed full screen; a cleaner and simpler navigation interface, and dozens of additional sounds. More details are here. Several users have reported issues with some of the new sounds added in this update. Uninstalling and reinstalling the program seems to resolve this, and it will be corrected in the update in a few days. The images of Baltimore and Bullock’s Orioles were inadvertently switched in this version, and will be corrected in the update. We’re planning to finish an emergency update by June 16th. Please contact me or add a comment here with any errors you find. I’m anxious to switch from my current iPhone to an Android-based phone. Are your developers still working on an Android version, and if so, when is it expected to be released? Yes, we’re actively working on this and hope to have it out within the next few months. Great news! Thanks for the status update. Dave, have you considered adopting the eBird nomenclature for subspecific groups where possible? I would encourage you to do so. Hi Elias, I’ll take a look at this. I think the names are pretty close already, so for most species it will be no problem. A client recently pointed out your new iPhone app. Great job with it! In playing around with it yesterday, I noticed that the male Eastern Purple Finch illustration is a male House Finch. Also, will you be updating all the various genera proposed in the next AOU supplement? Hi Chris, Thanks. I had heard from someone else about the finch, and will fix it in a few weeks with the next update. And yes, I do plan to continually update the names in the eGuide to match the latest official AOU list. Hi, I would like to add my voice to those who are looking forward to the Android version. I just bought Birding Basics for my nook, and now also have it on the nook Android app. Looking at that ebook on my Droid made me realize how cool and useful an app like this would be on the phone! David, have you considered adding a Twitter and Facebook function to the Add Bird on the eGuide. Sort of like what Foursquare does so when I log in a bird, it could broadcast out to my Twitter and Facebook account saying what bird I saw where and when and with the a note. Would be a good way to promote the eGuide. I love the iPhone guide but it is not ideal on the iPad. Do you plan a dedicated iPad guide? We’re talking about an iPad version, but no definite plans yet. 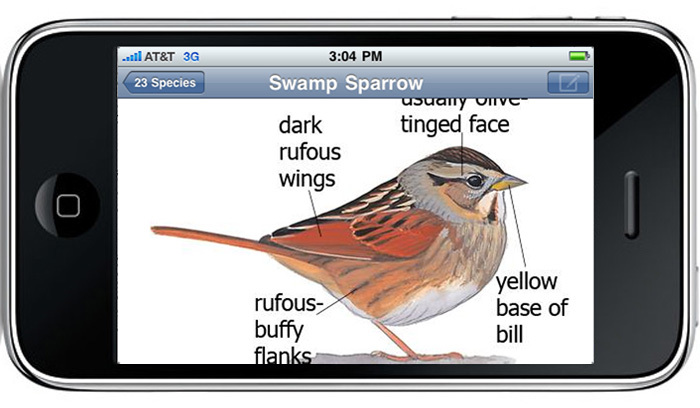 I have no iPhone…yet (waiting to get the Verizon version), but I swear by the Sibley’s Guide to Birds! Another user anxiously waiting for the iPad version of the eGuide!